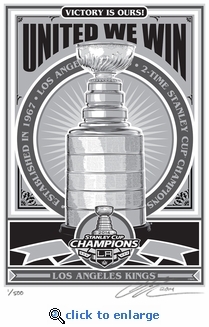 Capture the memory of seeing the Los Angeles Kings claim their second Stanley Cup in three years with a handmade 2014�NHL Stanley Cup Champions Sports�Propaganda�Serigraph. Limited edition of 500. Print features metallic inks providing a unique pop which can't be seen in the digital image. Unframed measures 21"x17". Also available double matted in black, white-core mat board, and framed with a one-inch black wood molding ($60 additional, select above). Framed print measures 24 (H) x 18 (W). 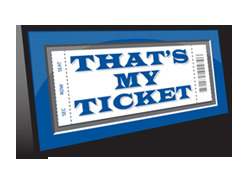 This Sports Propaganda original collectible adds a touch of class to any sports fans wall. About the artist: A lifelong lover of sports as well as a passion for history drove Chris Speakman to create Sports Propaganda limited-edition prints. Conceptually inspired by the various war-like rivalries around sports as well as propaganda art from the 1940s. Chris's work was selected for the cover the of the 2011 MLB All-Star Game program and for the cover of the 2013 Beckett Magazine Art Issue. His art has also been featured in the Boston Sunday Globe, ESPN.com and on CBS-Boston TV. If you would like to see how these prints are made please watch the following video. Capture the memory of seeing the Los Angeles Kings claim their second Stanley Cup in three years with a handmade 2014�NHL Stanley Cup Champions Sports�Propaganda�Serigraph. Limited edition of 500. Print features metallic inks providing a unique pop which can't be seen in the digital image. Unframed measures 21"x17". Also available double matted in black, white-core mat board, and framed with a one-inch black wood molding ($60 additional, select above). Framed print measures 24 (H) x 18 (W). This Sports Propaganda original collectible adds a touch of class to any sports fans wall.